On June 21, 2015, after admitting to an extra-marital sexual relationship, Rev. Tullian Tchividjian announced his resignation as senior pastor of Coral Ridge PCA in Fort Lauderdale, Florida. This was devastating news for me. Over a number of years, Tullian’s teaching, along with Paul Tripp, Ray Cortese, John Frame, J.D. Greear, Matt Chandler, Joe Novenson, Tim Keller, John Piper, Scotty Smith, Nancy Guthrie, and Elyse Fitzpatrick, have all been refreshing gospel voices for my soul. Of these, as Billy Graham’s grandson, Tullian is one of the most popular. His recent book, One Way Love, had a big impact in American Christianity. In fact, we used this study last year at Surfside Presbyterian Church and a number of people in our congregation were deeply encouraged by the wonderful emphasis on the enduring love, incredible adoption, and glorious gospel freedom that we have in Jesus Christ – our Savior and Lord who has chosen us, called us, saved us, freed us, and holds us firmly in his ever gracious grip. Tullian’s message – brought to life beautifully from the very pages of the scripture – has been a clear gospel bell ringing for so many of us who have been steeped in hopeless legalism. Yet, sadly, at some point Tullian’s faith in Christ weakened. He took his eyes off of Christ, stared at the idolatrous comforts that our world has to offer, and he deliberately and selfishly chose to numb his pain in the arms of those destructive idols. It is a familiar story to us all. It is an ancient story. It is the story of Adam and Eve. It is the story of David and Solomon. And it is the story of us. 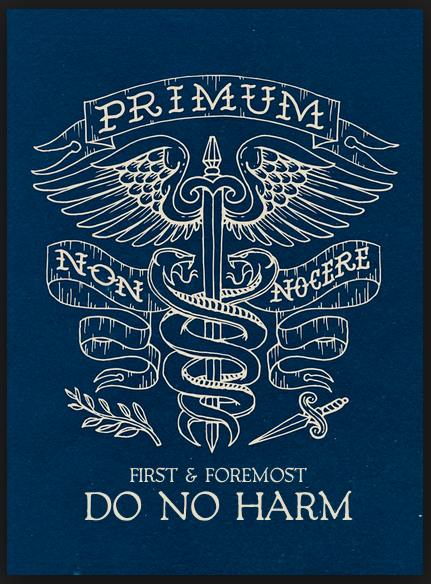 In the Hippocratic Oath, made by medical doctors, we find the latin phrase, “Primum non Nocere: First and foremost, Do No Harm.” As I look at this particular story, I am grieved because Tullian’s sin causes harm. Not only does it cause harm to Tullian and his family, but it causes harm to all Christians, to all believers. That’s how sin is. It is never localized. It is never private. It’s not like a single shot from a handgun, it’s like a nuclear bomb – and the fall out is always devastating. But just to be clear, I’m not just grieved over Tullian’s sin – I am grieved over all sin. I am grieved over mine. And I am further grieved by the responses I am reading and hearing. As the fallout continues from this high-profile fall, many articles related to Tullian’s sin are already being posted online, and I am sure more are forthcoming. Just today I read an article titled, “7 Reasons Why High-Profile Leaders Like Tullian Tchividjian Fail.” In posts like these, I read that Tullian failed because: he was too busy, he was too confident, he was too negligent, he was too lonely, he was too popular, he was too imprudent, he compromised holiness, he failed to strengthen weak areas, he minimized accountability, he ignored safeguards, and so on. Now, many of these things may be true on some level. But I must say that it deeply grieves me that we do not seem to understand the root of what really happened here. Tullian’s sinful decision to pursue an affair was not ultimately a result of any of those things. I can say without any doubt, Tullians’ fall was exclusively related to a weakened dependence upon Christ. Tullian’s tragedy is the prospective tragedy of every Christian pastor: He forgot the very gospel that he preached. This entry was posted in Gospel Thoughts and tagged 7 Reasons why high profile leaders like tullian tchividjian fall, Billy Graham, Billy Graham's grandson, Coral Ridge Presbyterian, Do No Harm, Hebrews 12:2, Hippocratic Oath, Jesus Plus Nothing, Primum non Nocere, Tullian Tchividjian. Bookmark the permalink. Thank you zabbakaye. Christ’s blessings. Tim, who was the really old dude on the CBC staff who was a widow two or three times, and was a retired Navy Chaplain; anyway, I remember him telling some the “preacher boyz” that the only way he endured multiple months and years at sea as a chaplain was to acknowledge EVERYDAY his vulnerability as a man, the temptations of the flesh, and to keep the issue of sexual purity in the front of his brain. . . not to take his fidelity and commitment to his wife for granted, but to allow God’s Holy Spirit to saturate his soul, especially in the areas of sexual sin. I concur with your thoughts and comments, I did not know this pastor was a CIU graduate, but it doesn’t matter who you are, or where you come from, or what degrees you have; we are all vulnerable to sinful tendencies, and a daily dose of God, His Spirit and His Word are proper defenders of our purity. I’ve spent literally thousands of hours in Eph 5-6 over 28 years of marriage, and deployed/separated from Lana for close to five years accumulative on deployments, training and schools. Well said, brother. God bless, Cro!